I never take a lot of fireworks photos because I never like how they come out, I always forget to bring my tripod, and I hate messing around with camera settings when I should be enjoying the full razzle-dazzle effect of the show. 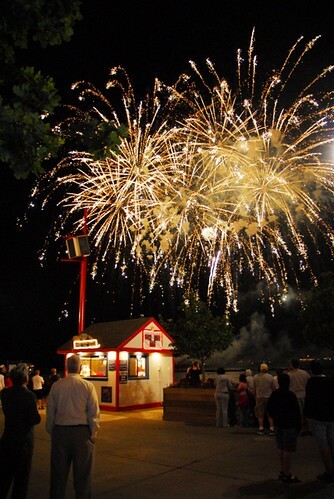 Having said that, I took this fireworks shot last year from Chicago's Navy Pier and it didn't come out half bad. But, like I said, I don't remember a darn thing about the show because of having to deal with the camera. 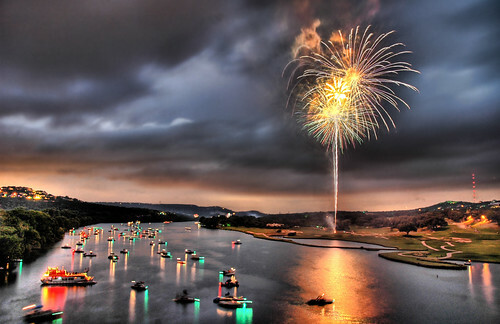 Now, if you REALLY want to see what I consider one of the most awe-inspiring fireworks photos of all time, check out Trey Ratcliff's photo of Fourth of July on Lake Austin (below) -- but don't just look at it on MY silly webpage. You'll find it here on his website http://www.stuckincustoms.com/ (take a look at his other work while your at it) and I suggest saving it to your desktop. You'll be glad you did. Trey transforms his photographs using High Dynamic Range photography. And he does it well.